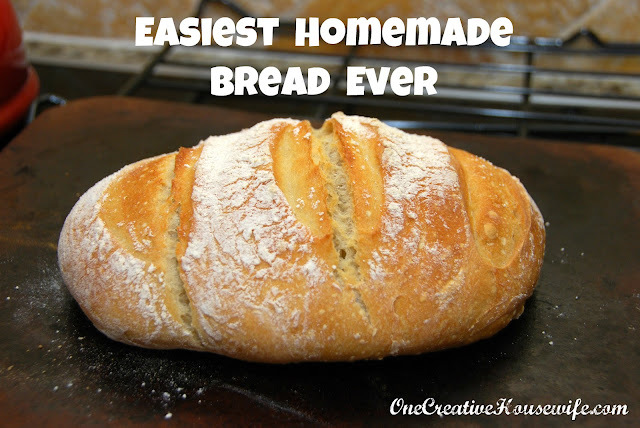 This is the quickest and easiest homemade bread I've ever made. Just Mix, Rise, Bake, Enjoy! It only takes 5 minutes to mix up, let it rise and you can keep it in your refrigerator for up to 2 weeks. This allows you to quickly have bread for any meal. 1. In a 4Qt. container (the 4Qt. Pyrex bowl works perfect) mix flour, yeast, and salt. 2. 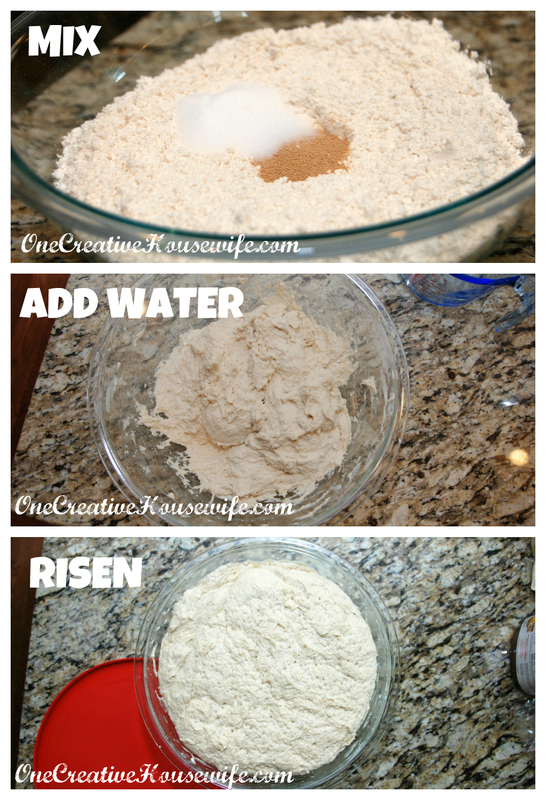 Add water and mix until all the flour mixture is moist. 3. Lay lid on container, but do NOT seal it. 4. Set bowl in a warm spot and allow dough to rise at least 2 hours. 5. After the dough has risen you can place it in the refrigerator. 1. Take dough out of the refrigerator. 2. Sprinkle a section of the dough with flour. 3. Pull the section of dough with flour on it out of the bowl. You want a grapefruit sized lump of dough. 4. Use your hands to smooth the dough into a ball. If the dough is sticky sprinkle a little more flour on it. 5. Place dough on parchment paper, and allow the dough to rise for 45 minutes. This is really just to let the dough warm up a little, so if you don't get it out of the refrigerator in time just let it set while your oven preheats and bake it a little longer. 6. Place a metal cookie sheet/loaf pan on the bottom shelf of the oven. 7. Place a pizza stone in your oven and preheat to 450 degrees. I just used my Pampered Chef Rectangular Stone. 8. Sprinkle the top of the bread with flour and slash the top. 9. Place the bread (still on the parchment paper) on the stone in the oven. 10. Add 1 cup of warm water to the pan you placed on the bottom shelf of your oven. 11. Bake for 25 minutes. 12. Remove the parchment paper for the last 10 minutes of baking. 13. Once the bread is done baking, allow it to cool and enjoy! 1. You can form this into baguettes, pizza dough, rolls, or what ever you choose. You'll just have to watch your baking times. I purchased the Kindle version of "Artisan Bread in Five Minutes a Day"* by Jeff Hertzberg and Zoe Francois (This recipe is from that book). If you enjoy this recipe the book is a must have. It is full of amazing recipes....I may never buy bread or rolls again!!!! This is the "Artisan Bread in Five Minutes a Day" recipe. Fabulous cookbook...that and Jim Lahey's "My Bread" cookbook. Thanks! I'll definitely have to pick it up!!! How does it rise without any sugar? Yeast have the ability to feed off of sugar or starch. One enzyme breaks down the starch converting it to sugar and then another enzyme breaks down the sugar producing the carbon dioxide. So the bread is still able to rise even without the presence of sugar. 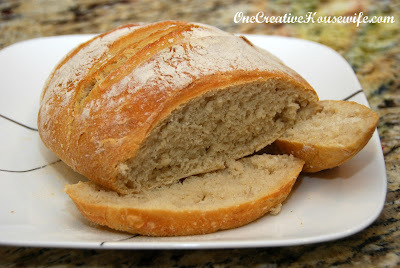 However, I did notice that the bread rises better using unbleached flour compared to bleach flour. I don't have a pizza stone. Any suggestions? You can use a cookie sheet, you just might not get the same crisp bottom crust. I have also heard you can use an unglazed tile from Home Depot or Lowes, although I really don't know how true that is.